Public Law 114-245: National Forest System Trails Stewardship Act, was signed by President Obama on November 28, 2016. We did it! BCHA, our partners and “Trails bill” sponsors have brought national attention to the trail maintenance backlog on our national forests. There is much more work ahead, however, as the agency has yet to enjoy increased funding and capacity to fully realize the goals of this new law. The National Forest Service Trail Stewardship Act of 2015 (H.R.845 S.1110). See other related news – National Forest Trail Maintenance Legislation H.R. 845 Passes House. 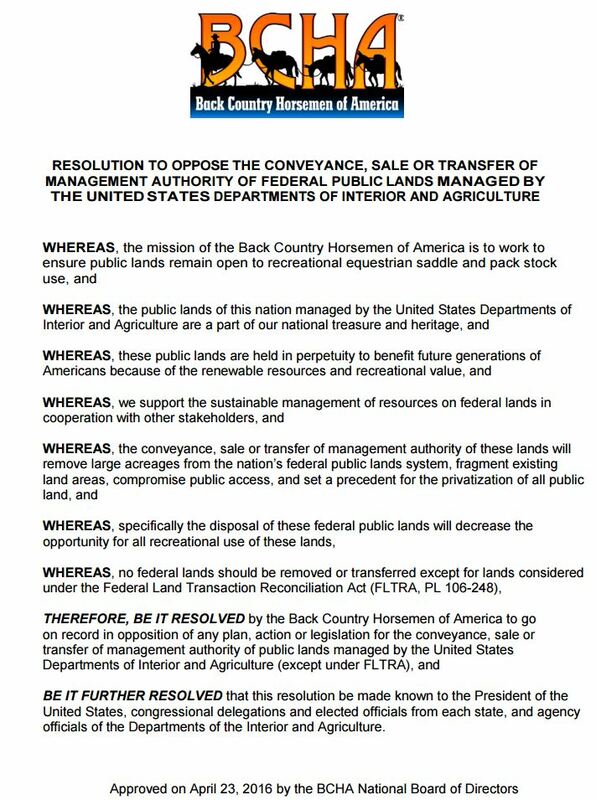 Back Country Horsemen of America(BCHA), The American Horse Council(AHC) , and the Wilderness Society were significantly involved in the creation and passage of this bill. This follows House passage of the bill earlier this fall. The bill, introduced by Representatives Cynthia Lummis (R-WY), Tim Walz (D-MN) and Senators Mike Enzi (R-WY) and Michael Bennet (D-CO), would direct the Forest Service to take several actions to help address the current trail maintenance backlog that is adversely impacting all trail users on many National Forests, including equestrians. BCHA is pleased National Forest System Trails Stewardship Act Signed into Law. The BCHA would like to thank Representatives Cynthia Lummis (R-WY), Tim Walz (D-MN) and Senators Mike Enzi (R-WY) and Michael Bennet (D-CO) for their leadership and work to pass this bill. The bill directs the Forest Service to develop a strategy to more effectively utilize volunteers and partners to assist in maintaining national forest trails. It will also provide outfitters and guides the ability to perform trail maintenance activities in lieu of permit fees. Additionally, the bill will address a liability issue that has discouraged some national forests from utilizing volunteers and partner organizations to help perform trail maintenance and will direct the Forest Service to identify and prioritize specific areas with the greatest need for trail maintenance in the national forest system. This bill will help improve trail maintenance without the need for additional funding.